To automate the volume and timing of feeds use a pump and timer to automatically switch the pump on and off. 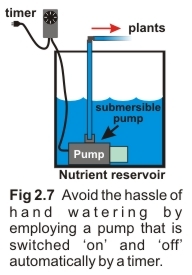 Make sure the pump is capable of delivering a sufficient flow rate. Apart from the pump’s output capacity, the flow rate will depend on the diameter and length of feed lines; the use of junctions; restrictive feed outlets (e.g. drippers); and the height to which nutrient will be pumped (i.e. ‘head’) - see Fig 2.8b. 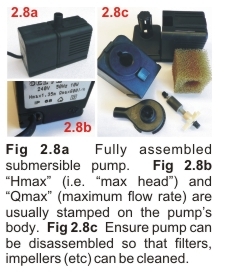 ● Removable filters and impellers: This assists with cleaning and maintenance (Fig 2.8c). Filters help prevent pump failure and the blockage of feed lines and feed outlets as a result of debris in the nutrient. ● Low intake allowing for operation at low water levels. ● High resistance to damage resulting from overheating if the pump runs dry (usually not available for centrifugal pumps). An auto shut-off function is preferable. ● They avoid priming problems. ● Fewer leakage problems because the plumbing junctions are within the reservoir. ● Quieter because they are silenced by the nutrient solution. ● Water cooled by the nutrient solution. “Max Head”? ‘Head’ specifies the maximum height to which water will be pumped. For example, a pump with a “Max. Head” specification of 2.0m means the pump is suitable for ‘lifting’ water to a maximum height of 2.0m. But note, at the 2.0m level, the flow rate will be zero, irrespective of the pipe’s diameter. So ensure to check that the flow rate at the maximum required height is satisfactory. Allow a safety margin to compensate for frictional losses from pipe sidewalls, junctions, etc.